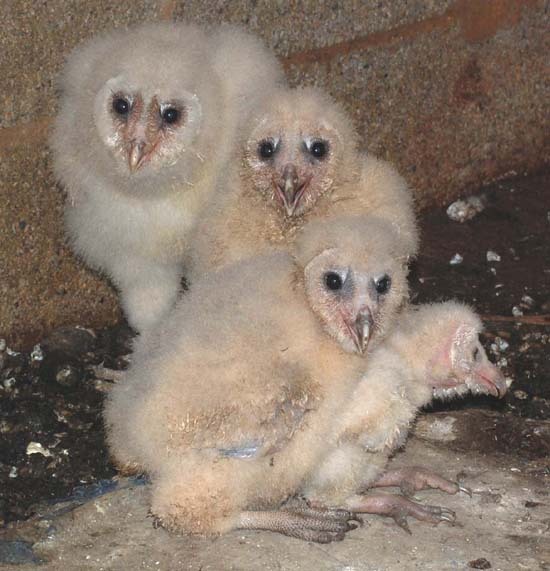 The barn owls renested this year in the north box, successfully rearing 6 young. There appeared to be at least two helper owls bringing prey to the entrance perch, but not entering. This may suggest that I need to provide a second nest box, perhaps in the front yard near the kestrel tower. The two species get along fine, especially since they work different shifts. Feb. 1 - 23:32 - One owl enters the box for 5 minutes. 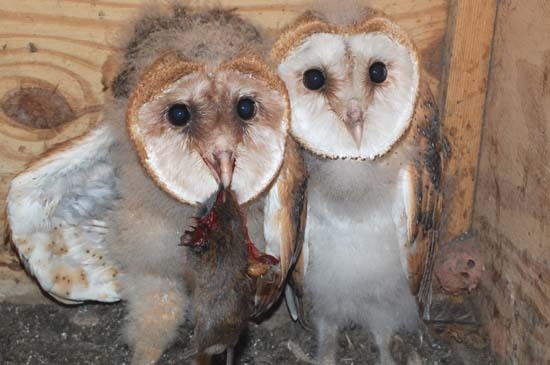 Feb 4 - 01:27 - Two owls enter nest box. Feb 5 - both owls enter box 3 visits, 10, 15, and 60 minutes. Feb 9 - both owls in box. First observed mating. Feb 10 - Female in box most of night. Male not seen. Feb 19 - Both owls in box for 4 hours. Frequent mating. March 1 - March 20 - Both owls in box every day. March 20 - 09:28 - First egg laid. March 21 - Only female in box. March 22 - 10:00 Second egg laid. March 25 - 08:43 Third egg laid. March 27 - Fourth egg laid. March 28 - 15:40 Fifth egg laid. March 31 - Sixth egg laid. female was in the nest box at this time. 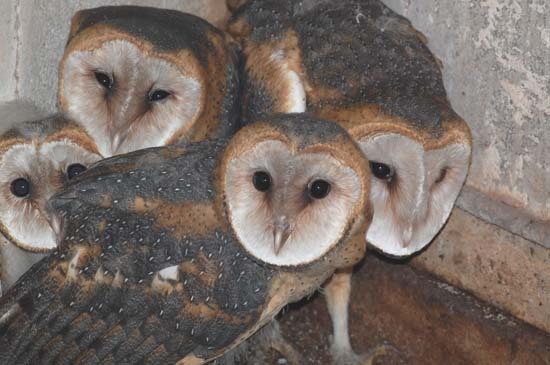 The three owls were quartering the field and garden behind the barn, with no apparent interaction, except perhaps by calling. In the light of the full moon, it appeared that they were oblivious of one another and concentrating on the job at hand - catching voles. I didn't see more than one take prey to the nest, but, the sheer amount of voles and the frequency of feeding suggests they were helping. 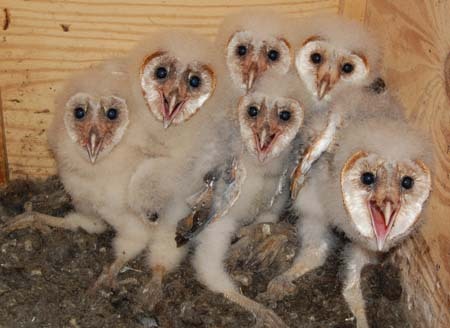 May 12 - All six nestlings doing great. Female still in box during day. 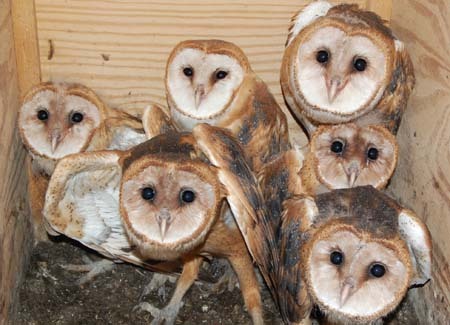 Helper owls observed again (total of 4 adults) and many surplus prey items in box each day. May 28 - First day female not in box during day. First photos taken. July 10 - Only one owl in box today for first time. 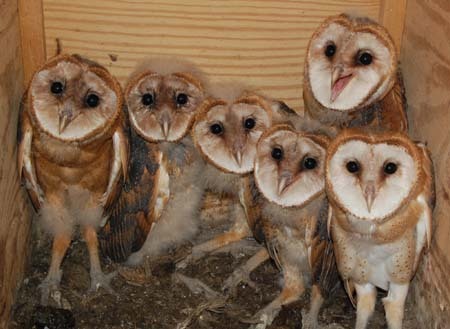 All six have been returning often at night to be fed on the perch or in the box. July 15 - First day box empty. Video cam removed. 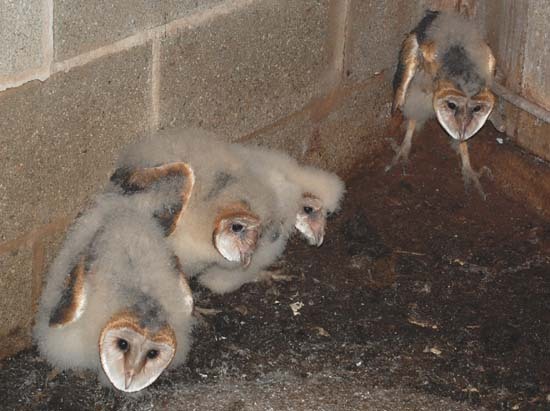 There were two barn owl nestings this year. 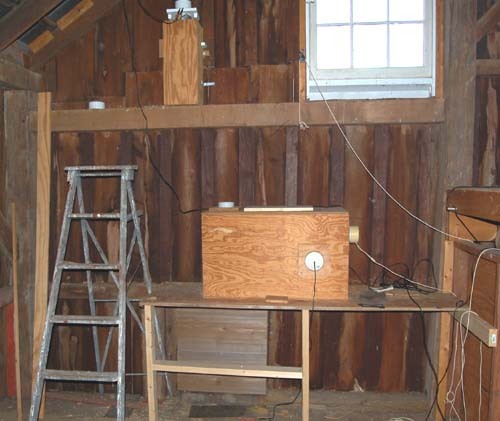 One nest was in the box on the north wall of the barn, as in the previous two years and the other was discovered in the entrance to the silo. The two nestings were several weeks out of sync and it is not clear whether this involved only one male or two. No video was used in the silo and an adult was never present by the time I opened the door. 1/8/2013 Both male and female remain in the box all day and most of the night. This continues until 5/2, when the male began to use the top of the silo for his day roost. 3/30/2013 The first egg is laid. 4/1/2013 The second egg is laid. No more eggs were laid. Incubation proceeded as normal. 5/3/2013 The first egg hatches. 6/18/2013 Female spends first day away from nest box. this continues for the remainder of the nesting. 7/9/2013 The first owlet is out of the box during the day, returns 7/10, out again 7/11, returns 7/12-15. This second nest was discovered 6/12/2013 in the entrance to the silo - a small room between the silo and the first floor wood shop. 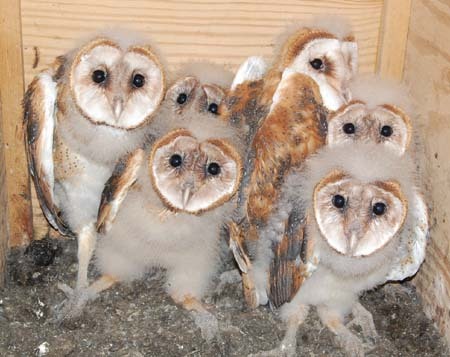 The door to the workshop had been sealed off and insulated for several years, so the nesting owls were not detected earlier. The opposite entrance into the silo is an 18" x 28" opening 30" above the floor. 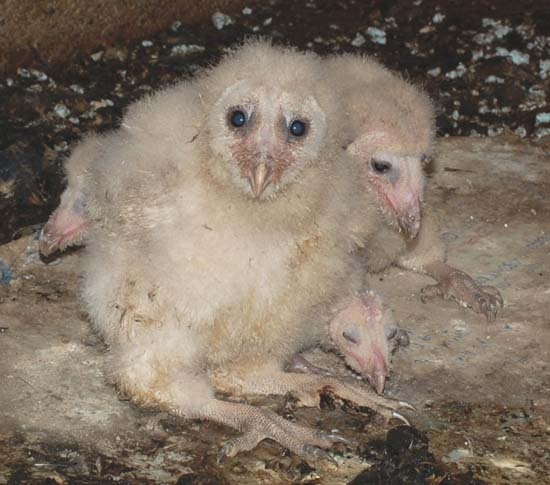 The 4 young owlets were huddled in wet debris and owl droppings and pellets on a cold concrete floor, looking quite miserable. Granted, this location is safe from predation. 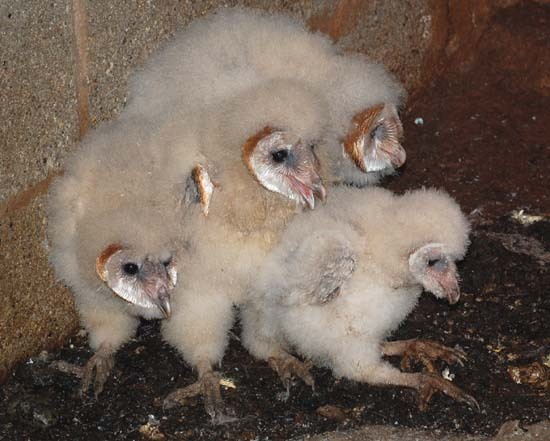 Reaching the nestlings would require a winged creature who could land on the top of the silo, drop down 42 feet to the bottom and pass through the 18" opening into the entrance room. And, in late summer, the underground room would be cool. But, the cement floor is always damp and often soaking wet from cracks in the walls and floor. 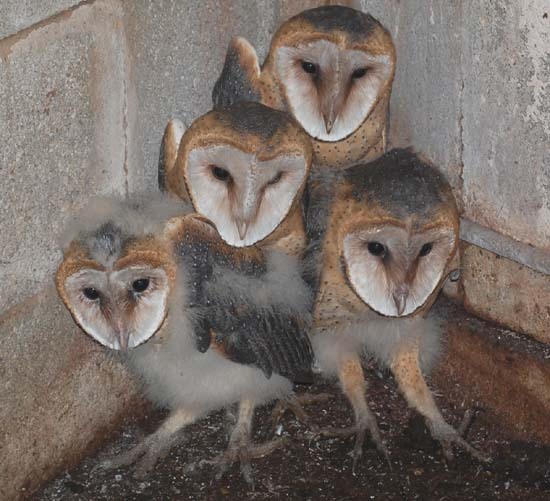 Also, while this is the first time owls have nested in the entrance room, they had, years ago, nested in both the top and bottom of the silo. 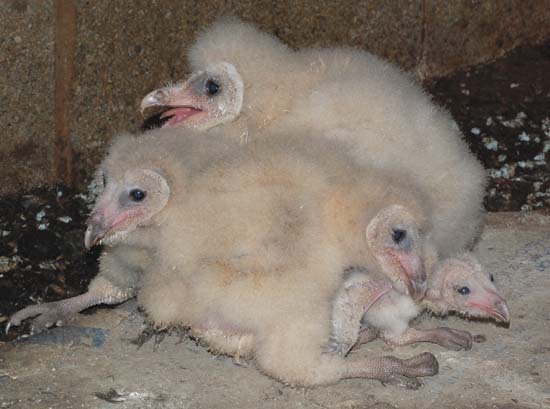 Nestlings on the bottom of the silo had great difficulty flying straight up to the top and the youngest sometimes were abandoned when the age difference was great. 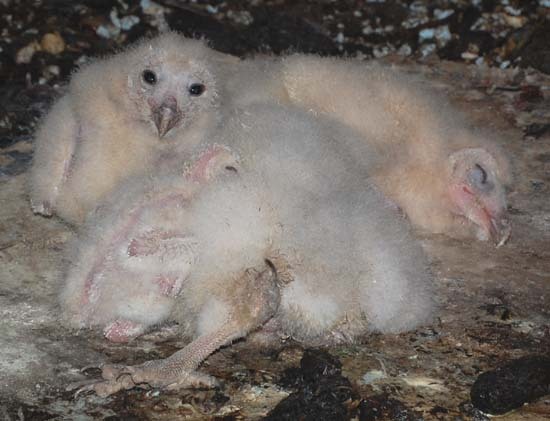 And, nestlings on the top platform over the ladder tunnel tended to fall off and end up on the bottom. However, this nesting was successful and all 4 fledged without my help. Their efforts to scale the silo wall were documented by deposits of whitewash under slight horizontal ridges on the wall where they could gain a foothold. 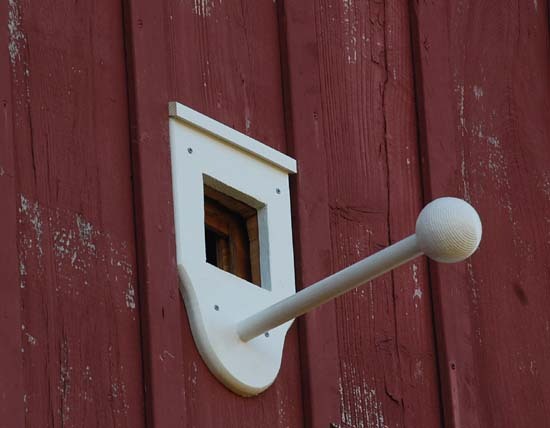 This winter I am converting the silo to a chimney swift tower and an additional owl box has been installed on the north wall of the barn. 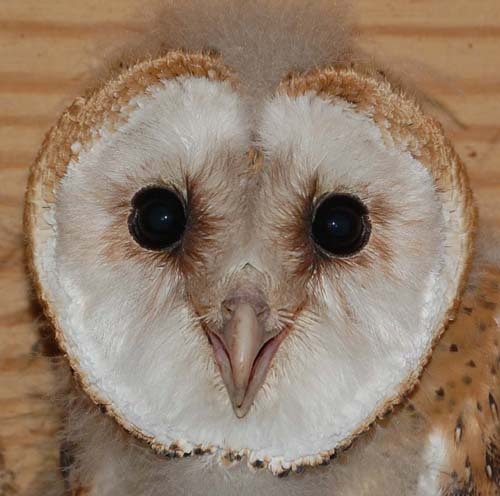 The boxes are being video monitored and female owls have visited the new box as well as the one used this year. It may have been the same owl visiting both boxes. The new box is rather close to the kestrel box, but the kestrels haven't seemed to mind all the owl activity on the north end of the barn the past two years. A kestrel even entered the owl box this summer when the two older nestlings were present. It looked around for a moment and then left. Neither species seemed bothered but an adult owl wasn't present. The new box and it's entrance are shown below.